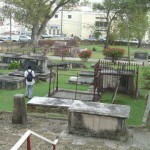 Seven generations of Nugents in Antigua inevitably means that many were laid to rest in the island’s various burial grounds. 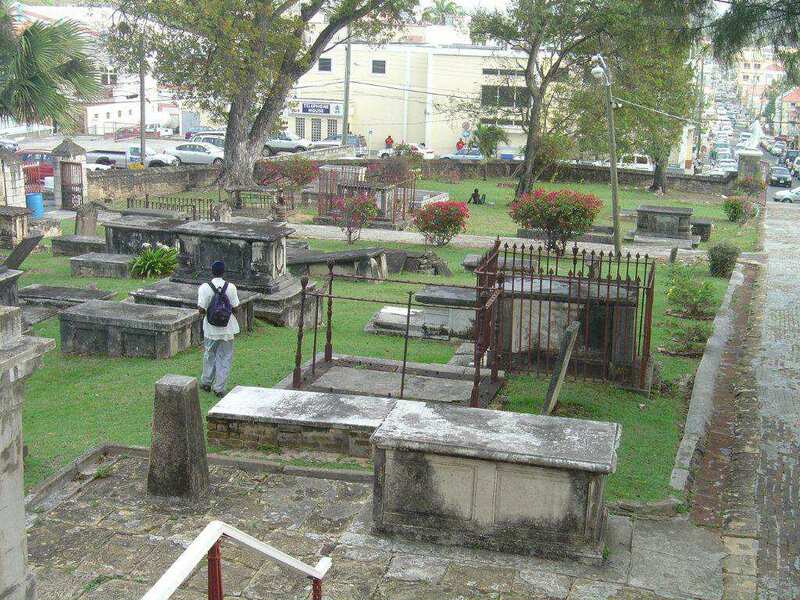 The comprehensive listings in V L Oliver’s The History of Antigua, published in 1894, tell us that 17 family members are buried in St John’s churchyard and these include Walter Nugent, the first Antiguan Nugent, who died on 5th August 1758. It has not been possible to identify the specific grave of Walter and records do not show whether his wife shares the same grave. A number of the others buried there are believed to have died in infancy, including Walter and Antoinetta’s infant son, also named Walter. One gravestone that can still be read marks the resting place of Harriet W Nugent who died in 1861 aged nine. 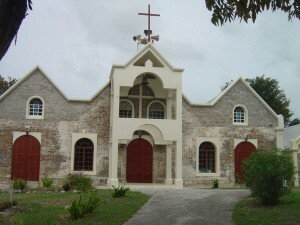 Across the island’s northern peninsula is the church of St George, which overlooks Fitches Creek. 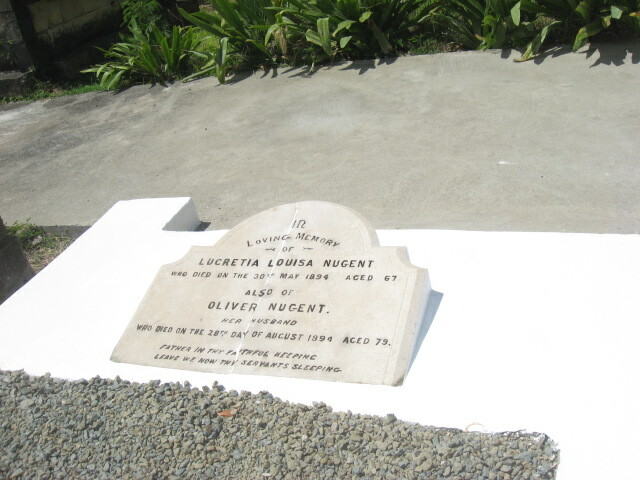 Here we find the graves of Sir Oliver Nugent and his wife, Lucretia, who were both laid to rest in 1894. When I first encountered their grave it was in poor condition probably as a result of hurricane Luis in 1995 which badly damaged the church itself. In 2011 we restored the grave in such a way as to minimise damage from future hurricanes. The pictures below show how the broken gravestone has been repaired and remounted on the newly reconstructed grave. It seems fitting that Lady Nugent, who is remembered for establishing Lady Nugent’s Cemetery (see Lucretia, Lady Nugent), should have her own grave preserved. Alongside Sir Oliver and his wife lies their grandson, my grandfather, George Nugent, who retired to Antigua after serving in Nigeria. George’s parents, Oliver and Mary, lie at St John’s municipal cemetery; their graves have recently been restored (see below). Upright gravestones are prone to damage from the region’s frequent hurricanes. 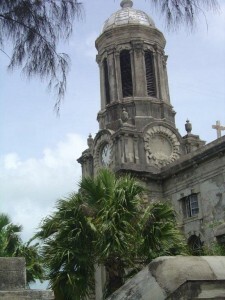 St George’s church later cathedral, which was first built in 1687, was rebuilt after being completely destroyed by an earthquake in February 1843, after suffering hurricane damage in 1965, and again from hurricane Luiz thirty years later. Sir Oliver’s father, Dr Nicholas Nugent, died during a visit to London, in Kensington in 1843. I have not so far been able to locate his grave, which was previously believed to have been at Highgate Cemetery. Dr Nicholas’s father, Oliver, is believed to have died in the USA, exact location unknown. VL Oliver’s records show that Nugents were baptised, married or died in at least five of the island’s six parishes, whilst my great grandparents, Oliver and Mary, were married at a seventh Anglican church, All Saints, in the middle of the island, which is not one of the original parish churches. Sources: VL Oliver’s The History of Antigua, published 1894 for burial data; pictures: Nugent archives; contemporary restoration pictures: Jan Augustin.